Paddy started working with his father Maurice at an early age. They shared a passion for two things – food and people. In the late 1950’s and 60’s the variety of choice in food products was bland and predictable. In the family butcher shop Maurice and Paddy were constantly looking for new products to entice their customers. When Maurice came up with the recipe for the Spiceburger it was an instant success. This success was mirrored and grew significantly when they started to supply the product to other Dublin butcher shops and take away outlets. This was due to the innovative and unique way of blending beef with onions, herbs and spices. The business grew to such an extent, in particular with the retail sector, that Paddy brought the product into full production. February 2000 Walsh Family Foods was sold to a third party, sadly the company went into receivership in 2009. Paddy’s passion for the Spiceburger combined with the love & loyalty of it’s customers resulted in him introducing an improved revised product back in 2012. Paddy is constantly working on the product to ensure it is always of the highest quality and takes account of the more sophisticated palate of the modern age. Throughout its long and varied life span the Spiceburger has developed a cult status with regular mentions in books, radio, TV shows, and even mentioned in movies. Neil O’Gorman joined Paddy Walsh as a partner in 2017 – they are ambitious to grow and develop the Paddy Walsh Foods brand. Paddy and Neil are ambitious to develop existing and new business to grow the Paddy Walsh Spiceburger brand. We are happy to talk to catering wholesalers, individuals, take away outlets and butchers alike. We look forward to talking with you to explore and develop business opportunities. Please contact us on the details below. 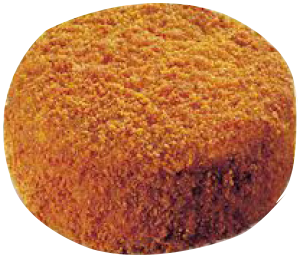 We produce 2 premium spiceburgers 92g and jumbo 140g.